These gently used books and catalogs are a great way to build your philatelic knowledge and library. All items are used and in at least "good" condition unless otherwise mentioned. I am constantly purchasing philatelic libraries, thus if there is anything you are seeking, please let me know. I guarantee your satisfaction. Due to the low prices, variations in weight, and different mailing methods, distances, and destinations, shipping cost is additional for items in the Specials Literature listings unless otherwise mentioned. When ordering please include a note in the shopping cart comments section indicating if you prefer faster/costlier or slower/cheaper delivery so that I may more quickly quote the shipping costs and options for you. Each item is usually one of a kind; orders will be filled in order of receipt. Payment by MasterCard or Visa suggested, but I will hold items for 10 days pending receipt of check if you prefer. Illustrations of books in the Specials section may show representative images and not the exact item. If you hover your mouse pointer over a picture, you should see a small message box stating if the image is representative or of the exact item. 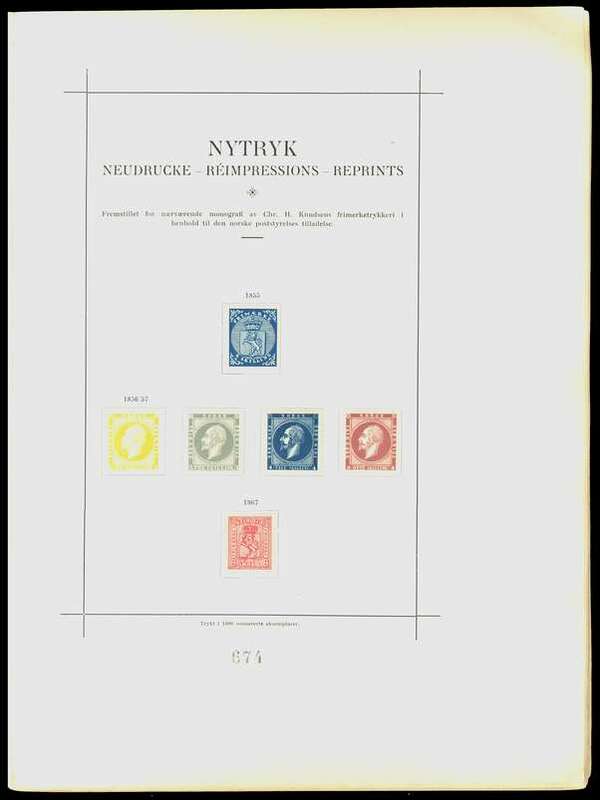 Norwegian Handbook 1855-1924: (1924, Anderssen and Dethloff; Norges Frimerker 1855-1924) Covers the development of the early stamps and proceeds from #1 through 1924 issues, including some early postmark information. Includes varieties, types, some postal rates, etc. For its day it was the definitive reference, however now it is mostly valued for the scarce 1924 reprints -- only 1000 books and thus 1000 sets of the reprints were issued. Published with an inexpensive soft cover which is virtually always damaged. This cover looks nice on the front and back, but has spine damage and the cover is separated from the spine (as usual). The pages are in excellent gently used condition. The set of reprints, and the page they are on, are excellent. Priced at only the selling price of the reprint set! Norwegian Handbook 1969 Volume III (WITH reprints): (1969) Also known as "Filatelistika". Includes stamps 1955-1968, postal stationery, early airmail, pre-stamp cancels 1845-54, extensive town (post offices) name list, cancellation types, meters, local posts including Spitzbergen, postal rates 1647-1719, ship mail, and much more. Many consider this to be the most interesting volume of the series -- CONTAINS A TREMENDOUS AMOUNT OF INFORMATION. Very gently used, this copy is priced hardly more the value of the official reprints it contains. Norway 4 Skilling 1855 WITH SOUVENIR CARD: (Jellestad and King-Farlow, 1955) Entirely in English discussing and illustrating the first Norwegian stamp. Production, varieties, cancels, postal history, etc. Still a sought after title. Includes "Large version" of 1955 Souvenir Card in perfect condition. The souvenir card alone regularly sells for $40! While this was previously owned, it appears to be in BRAND NEW condition. Norwegian Booklets and Vended Booklets: (Haga, 1985; Norske Frimerkehefter of Automathefter) A very useful, well-illustrated, and detailed "handbook" (no pricing) of the early booklets (regular and vended) issued up through 1984. Includes a lot of details describing differences between booklet types, which apparently resulted in modifying and extending the specialized catalog listings. The specialist or booklet collector will like this. In Norwegian, softbound, 67 numbered pages. (New is available for $11 #18022.) Pre-owned, but looks brand new. Postal History and Cancellations of Finnmark (Arctic), Hardbound: (Tegler, 1994; Posthistorie og Poststempler fra Finnmark Fylke) Important handbook and catalog of this Arctic Circle region. Pictures all cancels and includes towns, ships, railway, CENSORSHIP, Russian/Norwegian cancels, etc. Important for both Norwegian and polar postal history collectors. Though used, looks brand new, except for very minor wear on the back cover. Before I sold out of new copies they were $88 for softbound and $110 for hardbound! This is an important reference. Norway Crown and Posthorn Cancellation Catalog: (Bunaes, 1976; Fortegnelse over Posthornstempler med Kronet Posthorn) The only stand-alone catalog for these cancels, though they have been included in more modern (and more costly) books. Lists each postmark with dates used and other details; many pictured. In Norwegian, but with English introduction and extremely easy to use. 119 pages. Extremely gently used; looks absolutely brand new. The Ships and Post of the Local Routes in the Trondelag District: (Gjelsvik, 1986; Skip og Post i Lokale Ruter i Trondelag) Important postal history of the ships, cancels, sailing dates, etc., of ship mail in Northern Norway. Hardbound, 144 pages, well-illustrated. Virtually brand-new condition. Norwegian Machine Cancellations with Text 1903-1978 (from the Norman Gary Collection): (OFK 1979; Norske maskinstempler med tekst 1903-1978) Though this was superceded by a new book in 2007, this earlier listing is still a great way to get inexpensively introduced to the subject. Lists and pictures all machine cancellations with text or images (in the U.S. we call them "slogan cancellations"), lists all the towns in which they were used for each year, and the recorded dates of such use in each town. Organized by year for extremely easy use. Many cancels were recorded used only for extremely short periods, including only recorded used for one day. Includes section about the machines and devices and a thematic index. In Norwegian, but extremely easy to use. This was the personal copy of Norman Gary, with his notes about extended periods of use, etc. In good used condition. Norwegian Machine Cancellations with Text 1903-1978: (OFK 1979; Norske maskinstempler med tekst 1903-1978) Though this was superceded by a new book in 2007, this earlier listing is still a great way to get inexpensively introduced to the subject. Lists and pictures all machine cancellations with text or images (in the U.S. we call them "slogan cancellations"), lists all the towns in which they were used for each year, and the recorded dates of such use in each town. Organized by year for extremely easy use. Many cancels were recorded used only for extremely short periods, including only recorded used for one day. Includes section about the machines and devices and a thematic index. In Norwegian, but extremely easy to use. This example was pre-owned, but was apparently never used; looks absolutely new. Handbook of Norwegian Commemorative and Special Event Cancellations: (Johannessen, 1985; Handbok over Norske Saerstempler) Conveniently organized by date, pictures every cancel, and gives dates of use (many only one day). Also lists by town name for "hometown" collectors. Includes English introduction and translation of text of all cancels. Important for Norwegian postmark collectors and also collectors of many different topics. Now quite difficult to obtain. Pre-owned, but has never been used. Norway Postal Stationery 1872-1972 Catalog (from the Norman Gary Collection): (Soot-Ryen, 1972; Katalog over Norges helpost 1872-1972) An important catalog that includes ENGLISH text and DOES LIST the RATION CARDS too (unlike the current catalog). By comparison, the latest stationery catalog (#18103) is in stock for $68 and it does not include some things that this one does! This copy does NOT Include the reproductions of the first two postal cards, or any price supplements. This was the personal copy of Norman Gary (a major specialist collector of this area) and includes his many notations, corrections, points of identification, etc. Used, in very clean condition, and WITHOUT any loose pages as usual found! Norway Postal Stationery 1872-1972 Catalog: (Soot-Ryen, 1972; Katalog over Norges helpost 1872-1972) An important catalog that includes ENGLISH text and DOES LIST the RATION CARDS too (unlike the current catalog). By comparison, the latest stationery catalog (#18103) is in stock for $68 and it does not include some things that this one does! This copy does NOT include the reproductions of the first two postal cards (do not seem to have ever been present), or any price supplements. While this was previously owned, it is in BRAND NEW never "opened" condition -- this is significant because most used examples have loose pages. This one is perfect. Norwegian Local Post Stamps: (Pihl, 1963; Norges Byposter og annen norsk lokalpost) The classic catalog and handbook of Norwegian local post stamps. Though a 2005 catalog has updated values and information, there is a huge amount of information in this Pihl 1963 catalog that is not found anywhere else. This is still needed by any collector of Norwegian local post stamps. Original examples are quite scarce and almost always have significant binding wear. The cover of this example is separated (front from back, and from the block of pages -- but I have seen much worse), but the pages are in very good condition with only very minor penciled notations here and there. Nicer examples sell very quickly at $47. Very reasonably priced. 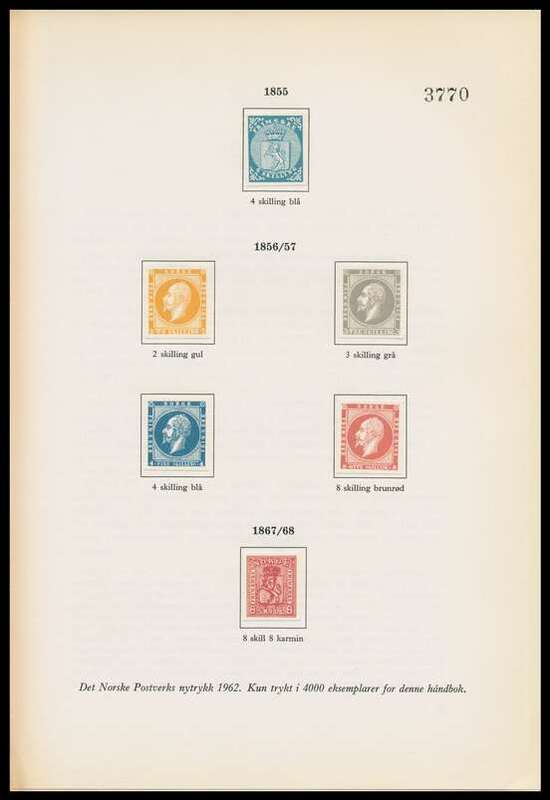 Norwegian Railway And Steamship Parcel Stamps: (Brofos, 1964) An original edition example of this valuable reference. While a photocopy reprint has been made available (#18056 $9.00), the illustration quality of this original is tremendously better. This is required reading for any collector interested in Norwegian railways and their stamps, steamships and their stamps, and even express service stamps; also probably to local post collectors too. Rarely offered and avidly sought after. Perfect "new" condition. Norwegian Maximum Cards: (Norsk Maksikort Forening; 1985; Maksikort i Norge) Interesting and useful 36-page booklet printed in an edition of only 500 copies. In Norwegian, discusses and categorizes maximum cards, with quite a few illustrations. Priced catalog listing of Norwegian maximum cards; the pricing is as of 1985, but it is the only such priced listing I have ever seen and it provides an excellent reference point for valuation of scarcer cards. Brand new copy from a boxed up literature dealers stock.